Modular Storage | Donnegan Systems Inc. 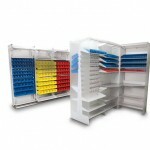 Flexibility meets durability in Spacesaver’s complete line of commercial modular storage systems. Engineered and manufactured in the USA, these systems are designed to be stable and safe while offering quick and convenient configurability. We have seen modular shelving utilized in a variety of spaces and across all industries, from IT departments to maintenance rooms to pharmaceutical storage and retail spaces. Modular shelving can solve all your storage needs. This modular shelving unit is made up of a basic frame, a unique rail system, and bins and shelves affixed to a rail. 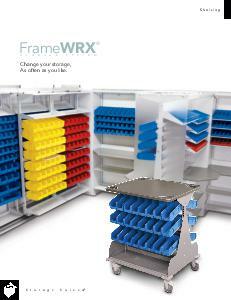 FrameWRX, also known as bin shelving, was designed to maximize the number of plastic containers that can sit on the rail. A simple adjustment converts the rails from horizontal to sloped storage. FrameWRX HD (“high density”) provides better visibility and easier accessibility than traditional high-density storage products. It is often referred to as “saving an aisle” because it compresses two rows together and can be pulled out for retrieving items quickly, easily, and safely. 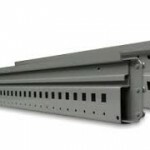 EZ Rail is the structural frame that works with FrameWRX, giving it added flexibility and configurability. 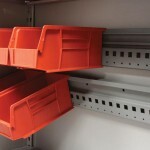 A simple, one-piece element designed to hold industry standard plastic bins, pegboard, slatrail, and slatwall accessories, EZ Rail can be installed with other Spacesaver storage systems such as cantilever library shelving, 4-post and Case type-shelving, and Universal Weapons Racks (UWRs). 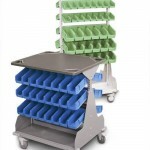 Traditional supply carts are available in limited dimensions and configurations, making it difficult to find the right solution for hospital supply storage, commercial cleaning supply storage, athletic team storage, and more. WRXWheels is mobile and easily configurable, creating convenient storage space for frequently used items. Our modular storage solutions are great for healthcare settings, IT workspaces, warehouses — any workplace that requires organized storage for smaller objects. You will receive a link to download this free brochure and your email will not be sold or shared.